To listen, instantly click on the title of the homilies you wish to hear OR click on Download (MP3) if you would like to download the homily to your computer. Today, we celebrate the Resurrection of our Lord Jesus Christ and learn its impact on our lives. All 3 Scripture readings for this weekend teach us to look to the future. In today’s Gospel, we hear one of the greatest parables Jesus ever told. In today’s readings, Jesus teaches us about God’s language of love for us all. The readings for this weekend teach us what faith looks like and how to respond to it. In the Gospel today, we have the classic story of Jesus battling the temptations in the desert. How appropriate for us as we begin Lent. In the Gospel, Jesus completes His Sermon on the Plain and teaches us about the importance of language. In this weekend’s Gospel, we hear the most difficult and annoying teaching in all of the New Testament. 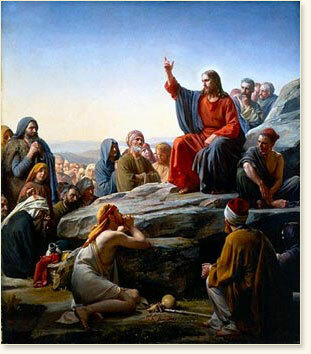 The Gospel today teaches us St. Luke’s version of the Beatitudes taught by Jesus. All 3 Scripture readings show us how God breaks into our life as well as the proper response. The first reading from the Book of Nehemiah gives us a great lesson about the importance of faith formation. The readings for this weekend give us an image of what faith looks like – a marriage between God and us. The Baptism of Jesus Christ was a great event for us and for the life of our Church. The Story of the Magi journey to Jesus Christ is in many ways our journey to God. Today, we hear about some Biblical Family Values that can make our personal families Holy. Today, the Prophet teaches the importance of Bethlehem and Mary in God’s plan of salvation. Today, we rejoice in hearing John the Baptist tell us what we must do to welcome Jesus in our life. In today’s Gospel, we hear of John the Baptist coming onto the scene and learn why he is such a great figure of the Season of Advent. Today and every day, We celebrate and acknowledge Christ as our King and the ramifications of it in our life. In the Gospel, Jesus speaks apocalyptic language that shouldn’t frighten us but instead be a source of joy for us. The Scriptures for this weekend speak volumes about the ability to grow our faith and have fulfillment in life. Today, we hear the classic story of Bartimaeus. This story isn’t necessarily a story of healing as it is of conversion. The Gospel story of the Rich Young Man teaches a great spiritual lesson of Detachment. The Scriptures for this weekend teach us how Marriage is a great gift given to us by God. In today’s Gospel, Jesus teaches us the virtue that we need to practice in order to live as His Disciples. Today’s Gospel is a wonderful summary of our faith. In the readings for this weekend we hear about the power of hearing the Word of God. The readings teach about the Laws of God and the importance of embracing them as a gift. In the Gospel, Jesus finishes His teaching on the Eucharist. It is interesting to contrast those that accept it and those that reject it. Jesus teaches something that all together radical and difficult for some to accept in the Gospel for this weekend. The 1st reading and the Gospel help us understand the Eucharist in a powerful way. All three readings this weekend teach us about the importance of living out our faith rather than giving it lip service. Today, we hear about the miracle of the Feeding of the 5,000 which is a story we experience at Mass. In the Scriptures for this weekend, we hear about the shepherds of Israel and the consequences of them. In the readings for this weekend, we see how people spend their time and the result of it. Today, in the Gospel, St. Mark compares and contrasts people with real faith vs. people with little faith. Today, our Church celebrates the birth of John the Baptist and how his story pertains to us. All 3 of the readings today speak to us about hope. In the First Reading, we hear the powerful story of the Fall from Grace. In this story, we learn about our human condition as well as what God intended for us before the Fall. Today, we celebrate the great gift that Jesus left behind for us and how it effects our faith lives. Today is a celebration of God in three Persons and what that means for us. Today, we celebrate the birth of our Church. We learn how we can live Pentecost everyday of our lives. Today, we celebrate Jesus ascending back into Heaven and in doing so giving us all the promise that we will follow. In todays' Gospel, Jesus teaches us how to remain in God's love. Today's Gospel gives us an organic image of what a life in Christ looks like. In today's Gospel, Jesus tells us he is the Good Shepherd and the implications of that for us. Click to access Homily Archives.